Given that this is like week 1, it'll almost certainly get harder. However, the other factors which come from moving to a new city + institution will probably die down and make the work easier to manage. No not that work. Certainly, I'm really on something like week 7. Sadly, I bet I'm the only one who actually has read the book by Eccles. But, lol. I was wondering in the second year and stuff does it get easier or harder. Its hard to think abstractly. P.P.P.P.S. Although, I do still plan to join a martial arts club. It might be easier for you to start now as the lessons may be sequenced (and routine wise it makes more sense). Hi! 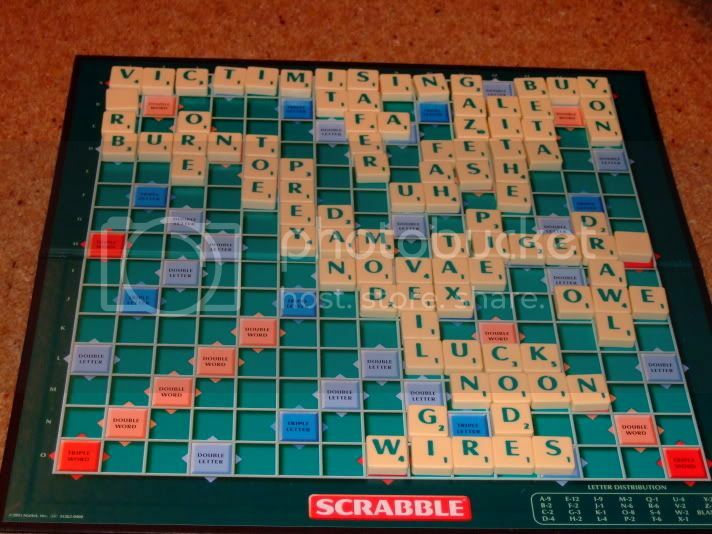 I have heard rumours (neither confirmed nor denied) that a particular hobby of yours is playing Scrabble; as I'll be studying at John's from next Friday, I should be most pleased if you'd agree to a fun ice-breaking game. **** got gnarly. I took the picture because I found it quite remarkable. Ah, the rumour originator! Looks like a tight but interesting game; LITHE seems like an excellent play and VICTIMISING just looks cool as hell. According to my copy of the Official Scrabble Words (I have had it a while now so new words might have been added ) but 'uh' is not in there. He beat the **** out of me. Uni maths is bloody hard. My personal tutor suggested trying to read A book called An introduction to metamaths by Kleene but its impossible to understand. I wonder when everything gets easy OR does it get harder? P.S. Although, self studying is pretty hard. P.P.S. Anyway, my social life has crashed back down to zero. As I have came to the conclusion that its pointless(I have also came to the conclusion that music is pointless and generally if its not abstract then its pointless). Also, its pretty boring getting drunk and talking to people. Reading a maths book is a bit better. P.P.P.S. I seem to be in the library all the time. pfft. don't waste your first year working. It's in my international edition, but asterisked as it comes from OTCWL - a North American word list. UH is certainly in there. And it seems that both blanks have been used rather poorly. Closer inspection reveals they enabled potential triple word scores depending on previous plays. Unless "ictimising" is a word, I'd have to say you're wrong. Oh and tigers on a triple word isn't gonna give you more than 25 - hardly worth using a blank for. verb/victim is a word (and clearly ising would have been added on as victimising is over 9 characters in length). Considering how these may have been the only options available one would rather go for a triple word score when available so the other player could not use it with potentially better words. Closer inspections reveals you tried to play internet cocky man and shockingly couldn't even do that - you must struggle in the real world. hopefully my timetable isn't so much of a female dog. Oh wow, I do Maths. I can post in here.